Several weeks ago a colleague of a colleague asked me to look at a “diet plan” and see if it was something that I’d recommend. It’s not uncommon that someone asks my opinion on different “ways of eating” to see if it aligns with a behaviors based, non-diet, intuitive eating approach. In this case, the person asking was curious about a way of eating that was being promoted by a supposedly weight neutral colleague. Always excited to learn about another way of talking about health promotion through food peace I excitedly, and naively, hopped over to google to learn more about this way of eating. In big bold letters it said “The Anti-Diet: diets don’t work.” So far so good, I thought. Then it started talking about resetting your metabolism and breaking stubborn weight loss resistance. Uh-oh. That doesn’t seem weight neutral. I continued scrolling… There was more co-opting of the language used with intuitive eating and a weight neutral approach- diets don’t work, people are confused, you don’t need another diet…then the pitch- all you need is our 12 week anti-inflammatory, personalized, X week diet approach. (That’s when I started face-palming and rolling my eyes. My kids were asleep or I might’ve started yelling at the computer screen.) I kept scrolling. Then there were weight loss transformation pictures. Then I couldn’t look anymore. UGH- no wonder why people are so confused. Diet culture is hard enough but when a program co-opts the language of a non-diet approach- says that their program isn’t a diet and THEN promotes diets it’s $&@*! Confusing! I mean, even a supposedly weight neutral practitioner fell for it! Why am I telling you all this? Because diet culture has become sneakier and more manipulative. They tell you that their way of eating isn’t a diet when it is! Diet culture and the diet industry has learned that you know diets don’t work– so what do they do- steal the language from the intuitive eating, health at every size, weight neutral approach. It literally becomes a wolf in sheep’s clothing. Diet culture now focuses on marketing towards healthy eating, wellness, clean eating even going as far to say that it’s not a diet- it’s a way of living or that it’s not a diet- period. This is where it gets tricky because if it’s restrictive, it’s still a diet. If it focuses on weight loss, it’s still a diet. If it says that you have to count anything (even if 200+ are free…), it’s still a diet. These patterns still reinforce diet culture. They make you more confused about what is and isn’t a diet. They disconnect you from your body and make you feel even worse- because it’s not supposed to be a diet. They reinforce and normalize disordered eating. If you haven’t noticed, they also make me mad! 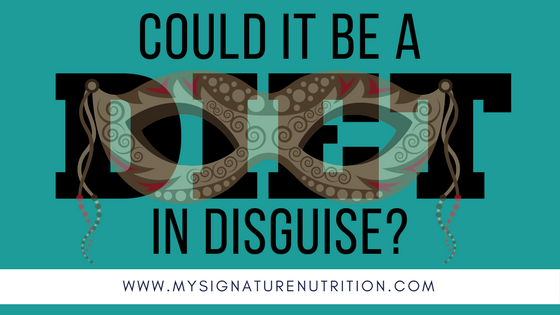 If you’ve started a way of eating this year that “isn’t a diet” maybe check yourself… Could your eating be a diet in disguise? 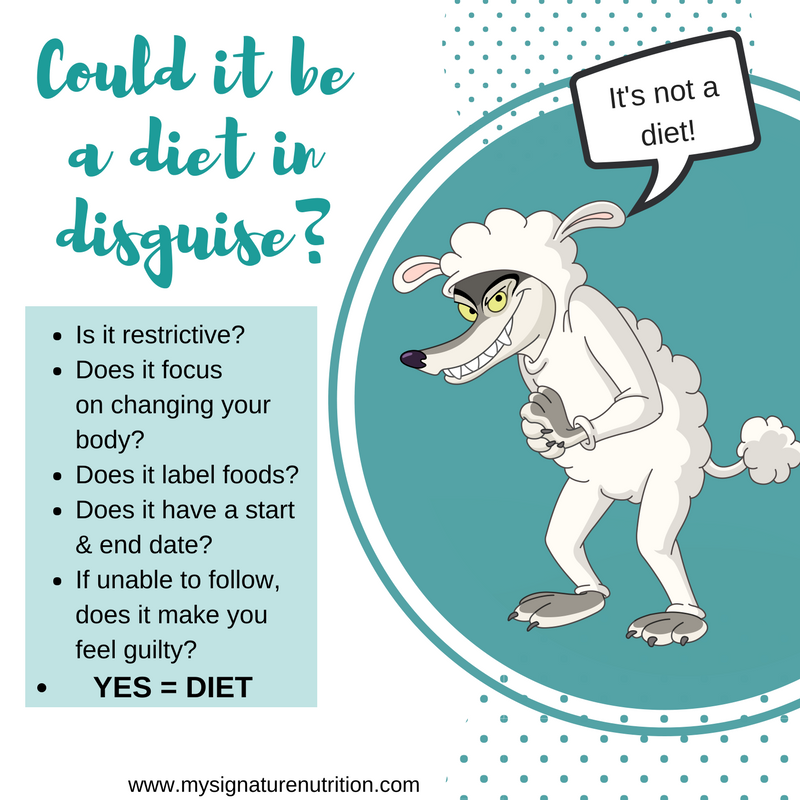 Could your way of eating be a wolf in sheep’s clothing? Could your eating goal appear positive, but end up doing more harm than good? Here are 10 questions to help you determine if your “non-diet” plan is still a diet. Is it focused on weight loss, body shape or size? Is it restrictive/are there any foods or beverages that you’re not allowed to eat/drink? Does it encourage ignoring hunger? Do you have to eat at certain times? Does it have a start and an end date, or a certain length of time, e.g. 30days? Does it encourage cheat days? Can you “blow it”/ Does it make you feel guilty or ashamed? Are there before and after pictures involved? Does it make you think about food more? The more you answered YES to- the more likely your diet is harming you. The more likely your “way of eating” is a diet. Don’t beat yourself up- even health practitioners have been duped into believing that a diet wasn’t a diet. Diet culture is insidious and tricky and mean. It doesn’t care about you- it cares about its bottom line. That’s why diet programs keep reinventing their program- they don’t work, but they need you to come back and buy in again, and again, and again. 1. If you haven’t already yet, get my free guide on rejecting diet culture. It will help you spot diet culture ASAP and help you begin the journey of focusing on and taking care of you! *The images of the books are amazon affiliated links. Should you click on the link and purchase I receive a tiny commission off of your purchase, which I greatly appreciate as it helps me offer free events- like Book Club! If you’re interested in reading Body Kindness- join our free virtual book club reading which meets on January 25, 2018 at 12:00pm. Sign up here. Missed this one? Sign up here to be part of future book clubs!